Priority Pass is the world’s largest network of independent airport lounges, with over 1,200 locations around the world. 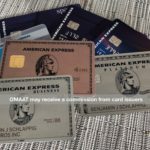 The number of Priority Pass members has increased greatly the past couple of years, ever since the Chase Sapphire Reserve® Card was introduced, as the card comes with a Priority Pass membership (as do several other credit cards). Priority Pass has gotten creative when it comes to the “lounges” they’ve added to their network. 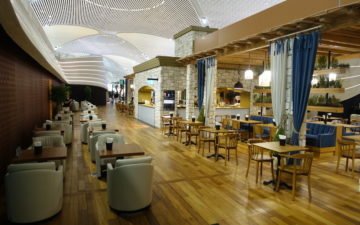 For terminals in which they struggle to reach a deal with a traditional lounge, Priority Pass has in some cases come to agreements with restaurants. Miami Airport actually has three Priority Pass restaurants, one of which was added last year, and two of which were added this year. Two of these are landside (before security), while one of them is airside (after security). Over time I hope to review all of them, but today I wanted to share my recent experience at Viena Restaurant, which looked to me like the most appetizing of the three options, and which I visited with Tiffany. Priority Pass members receive $28 of food and drinks per guest. Priority Pass members can bring as many guests as their particular membership type allows (for most credit cards this includes two guests). You do need a same day boarding pass to get the credit here, though there’s no rule that it needs to be an outbound boarding pass (so you could use this upon arrival, if you wanted to). Viena Restaurant is open daily from 11AM until midnight, so it’s useful for everything except breakfast. 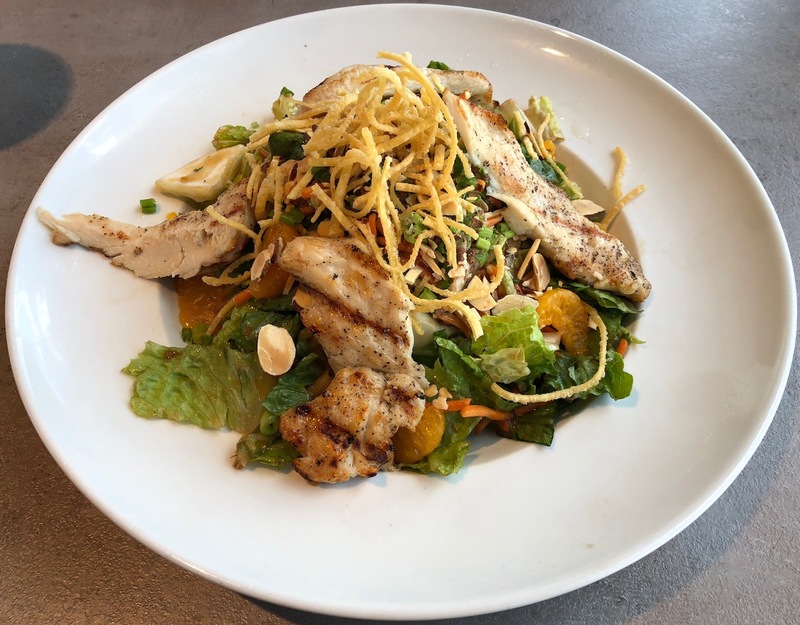 Viena Restaurant describes itself as being “farm-to-table, made from scratch with the freshest available ingredients.” While perhaps a stretch, itsounded more appealing to me than Corona Beach House or Air Margaritaville. The downside to Viena Restaurant is that it’s located landside, before security. Miami Airport has some of the worst security lines, so obviously this is ideal if you’re originating in Miami and arriving early, rather than if you’re connecting (unless you’re coming off an international connection, in which case you’ll be landside anyway after clearing immigration). Viena Restaurant is located inside the Miami International Airport Hotel. I didn’t realize Miami Airport had a hotel connected directly to the terminal until I visited this restaurant. The hotel and restaurant are located near the Concourse E check-in area, by the Iberia and Qatar Airways check-in counters. If you’re dropped off at the American Airlines check-in counter, just turn left when looking at security and walk about five minutes. Immediately behind that you’ll see the reception for Miami International Airport Hotel. To the right of that you’ll see two elevators — these lead to hotel guest rooms, as well as to the restaurant, located on the seventh floor. There’s no key or anything required to get into the elevator. Just outside the elevator is the entrance to the restaurant. The restaurant was really not busy, and there was a sign saying to seat yourself. The restaurant was quite large and almost completely empty, so I loved that. By contrast, I’ve found that most Priority Pass restaurants have become way overcrowded due to the number of people who have access. I suspect this is because the restaurant being landside limits the number of Priority Pass members wanting to use it. In addition to a main dining room area, the restaurant also had some seating that almost looks like it was part of an airline lounge, as well as a bar. Probably my favorite part of the restaurant was that it had awesome views of the apron and runways in the distance. This is even the “exotic” side of the airport, so most of the planes were from Eastern, Swift Air, Cayman Airways, etc. I know this is minor, but I was impressed they had cloth napkins, which you don’t often see at airport restaurants. I decided to order the Asian salad with chicken, while Tiffany had the spinach salad with shrimp. Both of the salads were very good, especially for an airport. After the meal we ordered some drinks — I had a cappuccino, while Tiffany had a coffee. At the conclusion of the meal we were presented with a check. The total came out to $51.23. I presented the server with our Priority Pass card, and tipped her in cash (I always recommend tipping at Priority Pass restaurants in the US, because your Priority Pass membership works no differently than a gift card here, and servers on the US rely on tips to make a living). This might just be my favorite Priority Pass restaurant I’ve visited yet. The restaurant was almost empty, had incredible views of the apron, the food and cappuccino were excellent, and the service friendly. The hotel wifi was also free to connect to and fast. Of course the major “catch” is that this restaurant is landside. Given how bad Miami Airport security lines often are, I wouldn’t recommend leaving security just to visit the restaurant, unless you have a really long connection. However, I was really impressed, and will definitely be returning the next time my travel originates in Miami, or I’m connecting off an international flight. This might just be the most peaceful place I’ve been in Miami Airport, which is otherwise pretty chaotic. I’ll be reviewing Corona Beach House and Air Margaritaville soon, though something tells me they won’t be quite as good. I need to take you to The Grain Store at Gatwick! The Corona Beach House is right after you clear security at Checkpoint 2. It’s ok for breakfast or a quick lunch. Oddly enough being Latin themed and in Miami, they don’t serve espresso only coffee. They also have a “grab and go” section that Priority Pass used to allow access to, but not since October 1st. Apparently airport employees heard about the Priority Pass benefit, so a bunch applied for a premium card and started obtaining snacks or meals every workday for for free. What is the meaning/reasoning behind the name? Is it misspelt or is there a significance behind Viena that I am missing? @Lucky: You should have had some of the starters. Pão de Queijo, Pastéis and Mandioca Frita are popular brazilian snacks. I love pão de queijo when is done right. I don’t think it’s so much that the lines are bad (when it’s been at its worse, it took me 20 or so minutes), but Terminal E is ginormous and it can take you a good 20 minutes just to walk to your gate. @Leeza1 – I wouldn’t have been able to resist! Now if only they’d add Versailles or La Carreta to PP, I’d be set. It is true that at Corona Beach House the “grab and go” and “to go” are not anymore available to Priority Pass members. Since a couple of months ago they started requesting to have a boarding pass of the same day, so airport employees were already excluded. So now the reason to cancel the grab and go is not for employees taking advantage, but simply because it was too easy and too many people were using the benefit. Viena is a Brazilian restaurant and fast food chain that is easily found in Brazilian airports and shopping malls. At restaurants locations in Brazil (there’s one in GRU), during lunch time, usually they have a self-service buffet where you are charged by the weight of your plate and during the night they have an all-you-can-eat pizza buffet (the different pizza types are brought to your table and you select one slice if you want instead of a self-service scheme). I wanted to visit this PP restaurant last week when I was at MIA but didn’t think I’d have time to leave and come back through security so I went to the Corona Beach house instead. I had breakfast and they give you $30 per person. The breakfast was fine. Then I asked the waiter about tipping and he said it was included and then asked if I wanted any drinks to go from the grab and go section so I got a few bottles of water. My OCD would not allow me to comfortably eat at a place name “Viena”. Maybe in Brazil, but not in US. Am I the only one who got excited about a PP restaurant @ VIE? @Lucky what was the check in procedure? Did you have to let them know you were using PP b4 ordering? Did they scan or check your boarding pass? Does an arrival one work? Thanks. @ Trey — I didn’t even let them know until the check arrived, and they actually never checked my boarding pass either. So basically, a random name selection, since nothing on the menu resembles anything from Wien. Just looks like general American fare.